MOTT HAVEN — Teens from three organizations have collaborated on a soon-to-be-finished mural against police violence and in support of neighborhood unity in the South Bronx. The mural, located in Mott Haven at the corner of Brook Avenue and 148th Street, depicts an ominous crew of police officers with faces are covered in riot gear and hands filled with nightsticks, riding horses wearing gas masks. People at the center of the mural look on, recording the scene with their phones. In the center of the mural, a cheerful tower rises surrounded by silhouettes of people talking, watching and holding hands. "It's really important, especially now, to focus not only on the violence but also the solutions," lead artist Raúl Ayala described community interaction as a vital component of the piece. 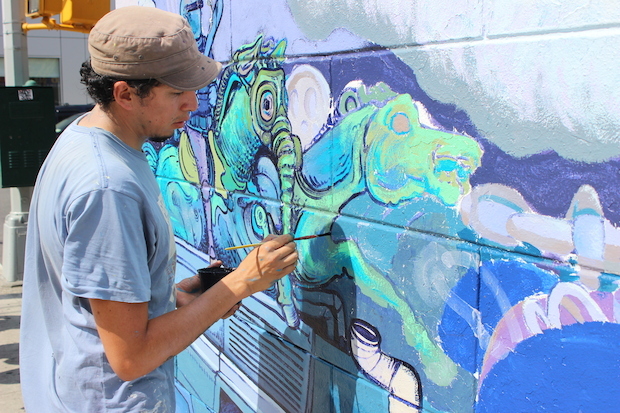 The mural is set to be unveiled at Brook Avenue and 148th Street on Saturday, Sept. 6 from 2 to 4 p.m. during a celebration that will include free food and music. It was a joint effort between the groups Caaav: Organizing Asian Communities, which works to empower refugees and Asian immigrants in the city, the Justice Committee, which is dedicated to fighting police violence and racism in New York, and Streetwise and Safe, which aims to educate people about interactions between LGBT youths of color and the police, organizers said. The Justice Committee has been working on murals meant to address police violence in NYC since 2009, according to co-director of the group Yul-san Liem. She described them as "a more creative and a more permanent way of doing community education." Steph Urena, a 22-year-old intern at the Justice Committee who lives in Mott Haven, said she hopes the mural will help people realize and understand the rights they have when dealing with law enforcement. "This kind of symbolizes that you can come together and have ways to have community safety and know your rights and how to protect yourself from the police," she said.